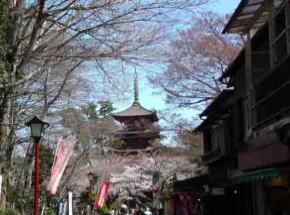 Passing through the Niomon Gate and going down the approach of Nakayama Hokekyoji Temple, visitors could find a five-story pagoda that is the symbol of Nakayama Hokekyoji Temple. 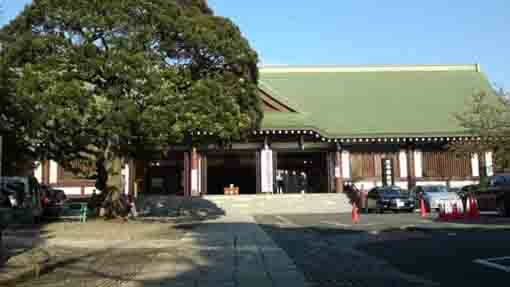 It is called Hokekyoji Gojunoto designated as the Important Cultural Property designated the National Government. This pagoda was built by much donation by the Maeda Family, a famous sengoku daimyo in Kaga province (Ishikawaken), in early Edo period. 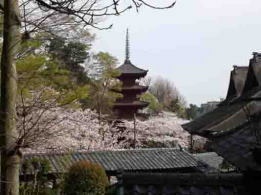 In spring, the gojunoto is decorated by the millions of cherry blossoms around it and visitors enjoy amazingly seeing it and the pagoda stands strongly like competing their heights with the giant ginkgo trees in the temple. 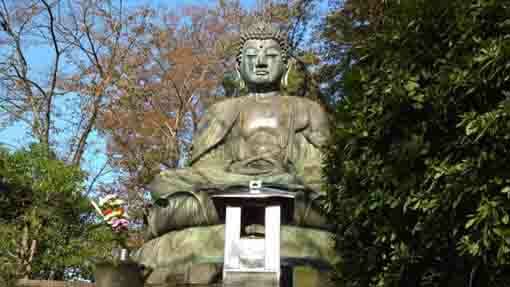 Why don't you visit Nakayama Hokekyoji Temple? 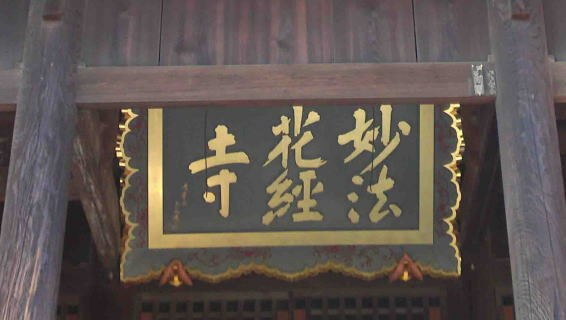 Date of designation; Taisho 5th of May 28th (1916). 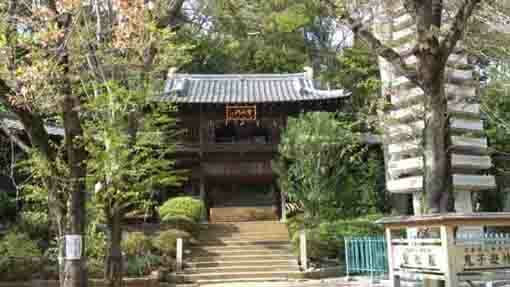 Date of construction;Genna 8th in early Edo Period (1622). 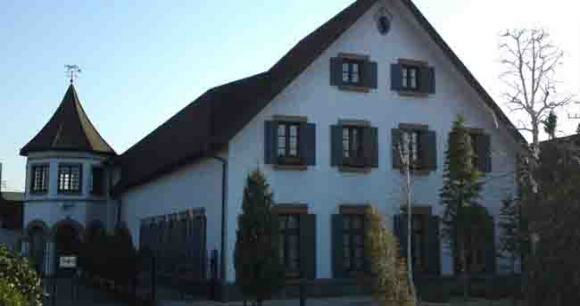 Architectural structure; 3 ken (5.46 meters wide) of five folds of toba tile stick copper thatching the roof with shingles. 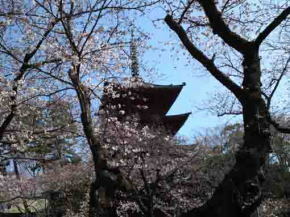 This five-story pagoda in Nakayama Hokekyoji Temple was built for praying for the reposes of Koshitsu Honami's parents' souls, Koshitsu got the support of Toshimitsu Maeda, the lord of Kaga, the second largest daimyo in Edo Period. 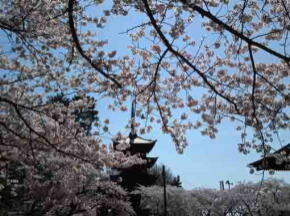 The height is about 30 meters tall, it is the typical scale pagoda built in Modern Times in Japan. 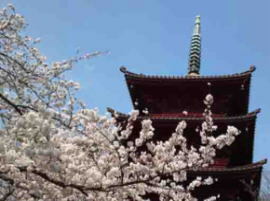 There are two other pagodas built in the same period of time and designated as the important cultural properties, the five-story pagoda in Honmon-ji in Ikegami Ota-ku and in Kanei-ji in Ueno Taito-ku Toky. 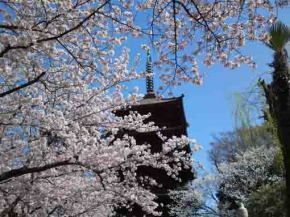 The five-story pagoda in Hokekyoji looks thinner than others as its eaves little stretched out. 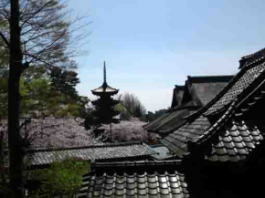 The architectural structure is mainly Japanese style, but its on the top floor is Zenshu-yo, one of the traditional temple architectural styles in Japan. It might be changed when it was tore down and repaired in Meiji 45th (1911). And the doors on the first floor is the style of Chinese door, is called Sankara-do,setting two horizontal crosspieces, with vertical crosspieces in the center and crosspieces. The windows are called Rengo-mado window in traditional style that, some vertical lattices are set laterally arranged at equal spaces on the frame on. 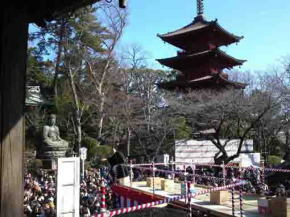 The center column stands on the center of the pagoda, and 4 columns called Shiten-hashira stand outside of the center column, and Zenshu-yo　(zen-sect style, kara-yo or Chinese style) Shumidan that is the platform to place and enshrine Buddha in Buddhist altar is set, and the wooden statue of Shakanyorai and Tahonyorai-zazo (both are the cultural properties designated by Chiba prefecture) are placed on the platform. Inside the pagoda, the Shiten-bashira and others are solemnly painted full-color and red. 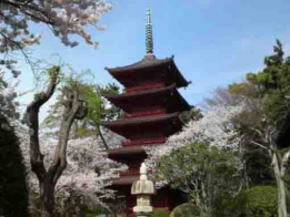 Moreover, according to Shochuzan Hokekyojishi (the history of Nakayama Hokekyoji temple), the Gojunoto was built in 1359 by the 18th abbot, the verenable Nichiji, and Edo Meisho Zue, tells that the statue of Nichiji was also dedicated in this pagoda. 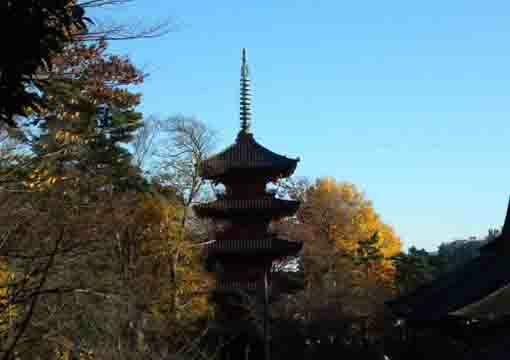 If they are true, there would have been a five-story pagoda before this pagoda was built. 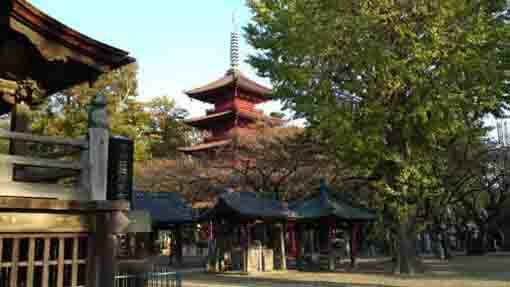 In Showa 55 (1980), it was painted with Bengal red when the five-story pagoda was repaired. 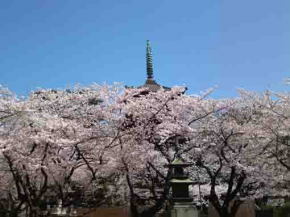 There are thousands of visitors in Spring to see the cherry blossoms in Hokekyo-ji. The scientific name of this stone is called calcic psephite breccia. 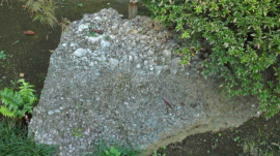 It dissolves, and it is rainwater with the emulsified body that the adhesive strength is sometimes strong in water including the lime, and limestone is heated underground and gathers pebbles and gradually grows big. Thereafter it appears on the earth and it looks like the pebble in the National Anthem that will not change for thousands of years as gathering to form a rock and wearing moss forever. The meaning of the anthem is extremely graceful. This pebble is found at the mountain side of Kasuga village Ibi-gun Gifu prefecture where the birthplace of the National Anthem, shows well the state of gathering and growing. 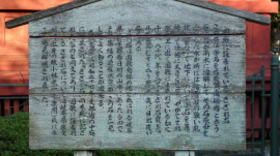 This report was copy of the wooden tag in the garden of the Ministry of Education, Culture, Sports, Science and Technology that was donated in Syowa 27th (1952), and the solution of the pebble in the National Anthem was discovered by Soichi Kobayashi (Sokan) from Ibikawa village of Gifu Prefecture. 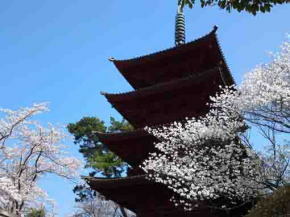 The five-story pagoda in Nakayama Hokekyouji Temple has great accessibilities from both Narita and Haneda International Airport.